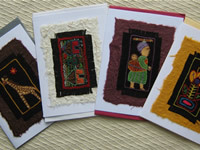 Handmade greeting cards with the hand-embroidered patch mounted on hand-made paper. 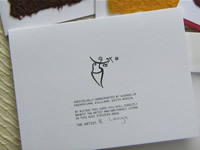 The artist who embroidered the patch is acknowledged on the back of the card and all cards are left blank inside for your own message. The cards come in a standard size of 11cm by 15cm, are sold singly with an envelope and sealed in a polyprop bag. 40 cards come supplied in a branded display box. Price R45.00. All pricing excludes postage. Wholesale pricing is available on request.